Recently I was asked to renovate the tile and grout of this windowless bathroom in a Beckenham flat which was not looking its best. 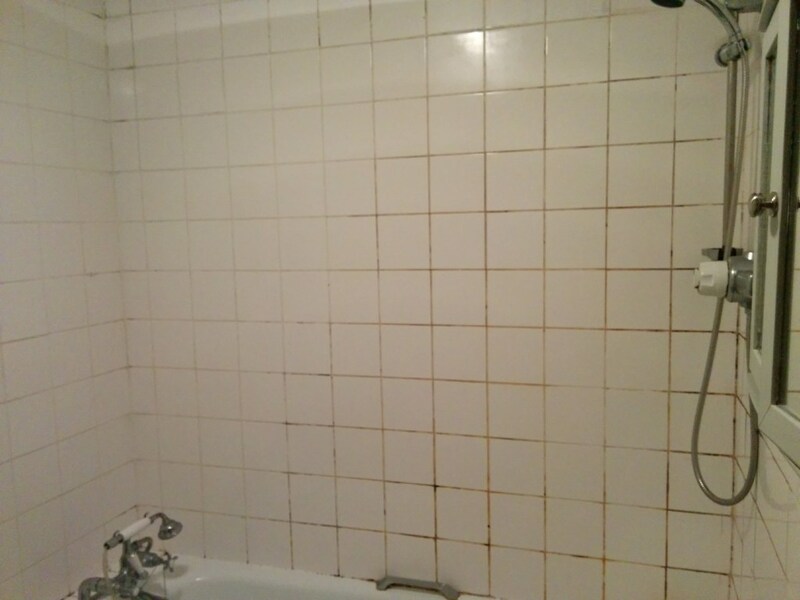 The Ceramic tiles had become dull due to a build up of Limescale and the grout had become stained from shampoo dyes and mould. Without strong ventilation and regular cleaning most bathrooms can end up with these problems however with the right products and techniques they can be renovated as you will see below. My first action was to apply a liberal amount of Tile Dr Oxy-Gel which is a strong alkaline tile and grout cleaning product that comes in a gel form. Being a gel it’s able to sticks to vertical surfaces for longer allowing it to break down the Limescale and soap residue that had taken up residence. Once it had been left to dwell for around thirty minutes, it was scrubbed off with water and a pan scrapper and then dried with a micro cloth. You can use this process with glazed ceramic tiles like these but for natural stone I would have used a different approach. I then sprayed Tile Doctor Duo Clean, which is a grout cleaner and mould remover, onto the grout lines. I left the grout with the Duo Clean on it for about ten minutes before scrubbing and rinsing off with water. 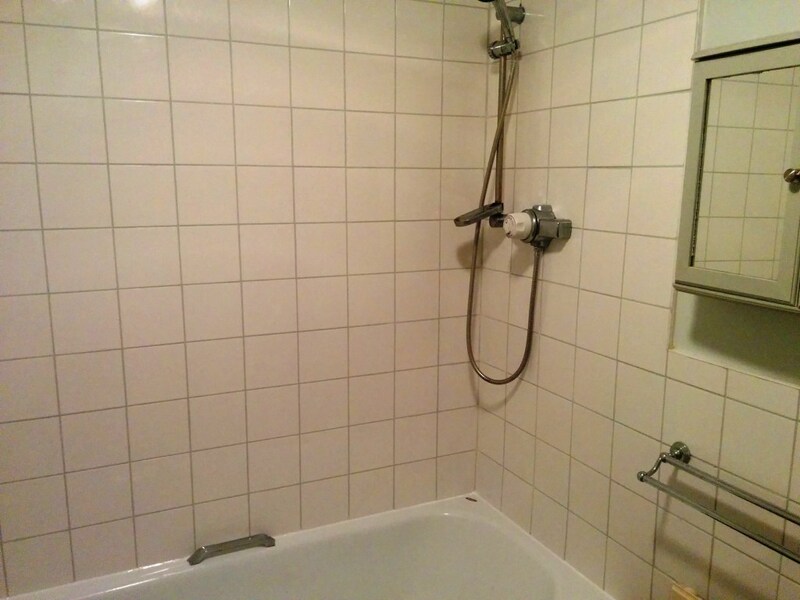 The process was repeated where needed until I was happy that the tile and grout were as clean as possible however to really give the bathroom a fresh look I decided to completely renovate the grout with the application of a Grout Colourant. There are ten colours to choose from in the Tile Doctor range of Grout Colourant’s and in this case I felt the best outcome would be to use a White colourant to match the tiles and restore the original look of the bathroom; the customer however wanted a grout colour that would provide a contrast against the white tiles, so in the end we opted for a light grey colour. The colourant is easily applied directly to the grout and in this case I waited for the tiles to dry before applying two coats with the aid of a small brush making sure to remove any excess that comes into contact with the tile. I finished the renovation by cutting out the original mastic sealant from around the bath and replacing with a new mould resistant silicone in white to match the bathtub. The bathroom now looks transformed and the epoxy grout colourant adds a layer of protection to the grout that will keep it looking good for some time to come. 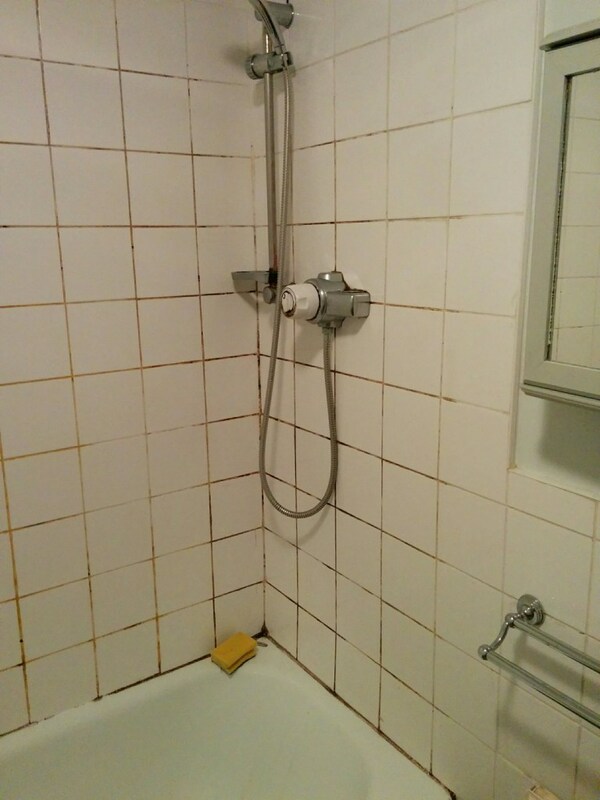 This entry was posted in bathroom, Beckenham, Ceramic Tile, Cleaning, Grout Colouring, Kent, Mould, Shower, silicone replacement, Tile Cleaning Activities, Work History by TileProf. Bookmark the permalink.